Koji is one of the crucial ingredients in brewing sake. Just what is it? 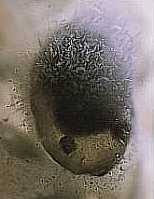 Koji is steamed rice that has had koji-kin, or koji mold spores, cultivated onto it. (See photo at right, which is a grain of rice cultivated with koji mold.) This magical mold, for which the official scientific name is Aspergillus Oryzae, creates several enzymes as it propagates, and these are what break the starches in rice into sugars that can be fermented by the yeast cells, which then give off carbon dioxide and alcohol. Without koji, there is no sake. For what it is worth, sake is not the only beverage in the world using koji. There are a couple of others throughout Asia. But the brewing methodologies are vastly different. A quick comparison between the production methods of sake versus other alcoholic beverages may prove useful. Wine is fermented from grapes, which already contain sugar (glucose, to be chemically correct). This is what yeast cells need for food. There are other kinds of sugars, but they cannot be metabolized by yeast. So in winemaking, yeast is added to a liquid already containing sugar. Beer and other beverages made from malted barley begin not with sugars, but with starches, which are molecularly monstrous. Here, brewers employ enzymes brought out in the barley malting process (where the barley is moistened and warmed, i.e. the sprouting process begun, albeit artificially) to break down the starches into sugars. These enzymes, which activate within very specific temperature ranges, chop the starch chains into much smaller sugar molecules. Some will be glucose and feed the yeast, some will be chemically different sugars and add to flavor. Back to sake. Sake is brewed from white rice stripped of its husk. There can be no malting, so the starch-chopping enzymes must come from somewhere else. Enter the cooperative koji. The dark-green spores, sprinkled onto steamed rice, graciously provide the necessary enzymes for saccharification. There are many enzymes involved in this process. Some act to create fermentable sugar (glucose), others act more to create sugars that will not ferment but will instead affect texture and flavor in a sake. Koji production (known as seigiku) is at the very heart of the sake-brewing process. The leverage it holds over the final product is immense . From a good beginning all things flow naturally, and so it is with koji. Koji is cultivated in a special room in the kura (brewery) called the koji muro. When ready, it is mixed with more steamed rice. Initially, yeast and water are added here. In later stages of a batch, koji is transferred into the large tank within which the sake-to-be is fermenting away. It continues to do its sugar-making work, while imparting the effects of its own sensitive production, until fermentation is finished. As an example of how sensitive yet powerful koji can be, I once had sake presented by the brewer with an apology: "Look, we just rebuilt our koji muro last year. The wood used for the walls was not quite as ready as we thought, and you can unfortunately taste the cedar wood in the sake." Sure enough, delicious though the sake was, the faint essence of cedar was evident in the flavor and fragrance. In general, the koji-making process takes 40 to 45 hours. During this time, the developing koji is checked and mixed constantly to ensure proper temperature and moisture, as well as an even distribution of both. 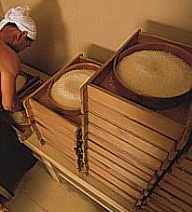 As the koji mold works its way into the center of the steamed rice grains, heat is generated. Different temperatures are ideal at different stages of the process. Not only that, but these ideals will change depending on the sought-after flavor profile. The type of rice, pH and mineral content of the water, and a myriad of other things affect the way koji is made as well. These variables compound to create a process that is more art and intuition than science. When koji is ready for use, it looks like rice with a small amount of white frosting on each grain. The smell and taste are slightly sweet, as might be expected. There is a characteristic light chestnut-like aroma that wafts wonderfully up. In response to the demands of the times, there are several manifestations of automatic koji-making machines. Some of these are fully automatic; insert ingredients here, stand back for 42 hours, here's your kooji. Others allow much more human intervention, some being only closed-loop temperature controlled tables. Even robotic-finger kooji mixers are out there. All of these work well; some better than others. On the quality-versus-labor-saved curve, these score very high indeed. But it is interesting to note that almost every kura in the country makes kooji for their best sake by hand.